Holt Phillips Services is proud to provide Trane® products for our customers. We sell, install and service all makes and models of air conditioners, but there’s something different about Trane® air conditioners. Trane® delivers more than assembled pieces and parts; they also deliver products featuring the most innovative cooling technology available today. The best part is that Trane® manufactures those products with the highest quality standards in the industry. As an independent Trane® dealer, we value reliability as much as you do! Our reputation is made after every installation. We are truly as personally invested in your comfort as you are and take pride in creating your perfect indoor environment. 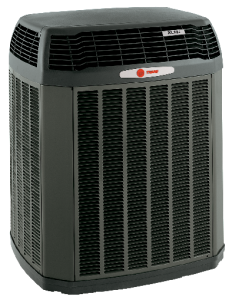 Trane® manufactures a comprehensive line of air condition, heating and humidifying products and it’s often difficult to know what you need for your home or business. You’re welcome to call your professional HVAC service technicians at Holt Phillips at (850) 897-5559 to evaluate your needs and provide recommendations. Americans have been relying on long lasting Trane® products since 1913, when James Trane and his son Reuben started the company. Since then, the Trane® brand has become a leader and have enjoyed many firsts in the heating and air industry. Trane® has a 10 years parts and 1 year labor warranty on Trane® equipment and Lifetime warranties on gas furnace heat exchangers. This new line features an all-aluminum coil, which is far more durable than standard copper coils that are susceptible to formicary corrosion. Because of this, families can stay comfortable indoors all year long, no matter the weather conditions. The double-walled, Air-Tite II cabinet eliminates the need for exposed insulation and helps prevent energy loss with the use of airtight plugs instead of conventional knockouts. This reduces the unit’s carbon footprint and provides a cleaner environment. The Trane® Vortica™ Blower is featured in the new Hyperion air handler, providing homeowners with reliable, ultra-quiet operation. You will be able to hear each other, rather than your heating and cooling system. Trane® CleanEffects™ added to your system can provide you with advanced air filtration that can remove more dust, pollen and other irritants from conditioned air for a cleaner, healthier, more comfortable home. We’re Doing Some Cool Things! Servicing Bluewater Bay, Niceville, Valparaiso, Shalimar, Ft Walton Beach, Destin, Freeport & Defuniak Springs.